An incident on the L3004, the road that leads from Oberursel to the Feldberg, on Monday, 3rd July, 2017 has left police asking for witnesses to come forward. At 5.30pm at the “Applauskurve” a 28-year-old cyclist and an 18-year-old motorcyclist were both travelling along the road. The cyclist says that the motorcyclist tried to kick his rear wheel, damaging his bicycle. No-one was injured, but police would like to hear from anyone who saw what happened on 06171 62400. 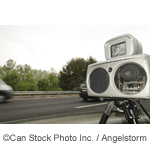 Once again the police in Oberursel (Ordnungspolizei) carried out speed checks on the Kanonenstraße in both directions on Tuesday, 29th March, 2014. Between 4pm and 6.20pm they measured the speed of 1046 vehicles on a stretch of the road where a speed limit of 80km/h is in place. 38 of those measured were travelling too fast, with one motorcycle travelling at 144km/h. The driver faces a €240 fine, 4 points on their license, and a one month driving ban. Once again the police in Oberursel (Ordnungspolizei) carried out speed checks on the Kanonenstraße towards the Feldberg on Tuesday, 24th September, 2013, this time using two cameras to catch motorcycles travelling too fest. Between 5pm and 7pm they measured the speed of 217 vehicles on a stretch of the road where a speed limit of 60km/h is in place. 58 of those measured were travelling too fast, with one motorcycle travelling at 124km/h. The driver faces a €240 fine, 4 points on their license, and a one month driving ban.